AND THE WINNER IS……DRUM ROLLS……..TERRI MILLER ! CONGRATULATIONS TERRI, SIDELINES AND OFFIELD FARMS CONGRATULATE YOU ON THE 2009 WINNING PHOTOGRAPH ! Harbor Springs, MI—World-renowned equine photographer Terri Miller was chosen as the winner of the third Offield Farms Shoot to Win Photo Contest held at the Rolex FEI World Cup Dressage Finals. 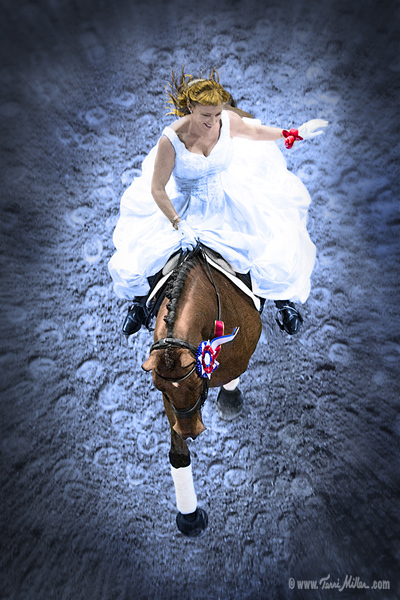 Miller’s winning photo, titled “Dressage Dream”, of Elizabeth Ball on Iris Eckstein’s Orion, was selected from dozens of photos submitted. The panel of judges was charged with the task of identifying an image that best captured the excitement of dressage and Miller’s photo was determined to best meet the criteria of the contest. Terri Miller, of Lake San Marcos, California, commented, “ I am thrilled to have won the Offield Farms World Cup photo contest, especially with this particular photo.” “Dressage Dream” was taken during the pas de deux competition held during the World Cup Finals. Ball and Orion were paired with Olympic medalist Guenter Seidel on Marie Meyer’s Fandango. The duo rode a costumed Phantom of the Opera piece that brought the house down. This is Miller’s second Shoot to Win victory; she claimed the inaugural prize in 2005. Her photos and painting have graced the covers of dozens of magazines, calendars and catalogs. Her work is frequently juried selections for museums, galleries and exhibitions, including the 2009 American Academy of Equine Art show at the Museum of the Horse. A graduate of New York’s acclaimed School of Visual Arts, Miller sees through the lens with the eyes of a painter. As a student of equine movement, Miller has a keen eye for finding the very best moments of energy, harmony and brilliance. “Terri’s photo is amazing, but a visit to our website shows that the judges had their work cut out for them in choosing the winning entry,” Offield stated. “I want to thank all the photographers that took the time to enter this year. It is appreciated and fun. “ To view the winning photograph and a gallery of many other entries, visit www.OffieldFarms.com. 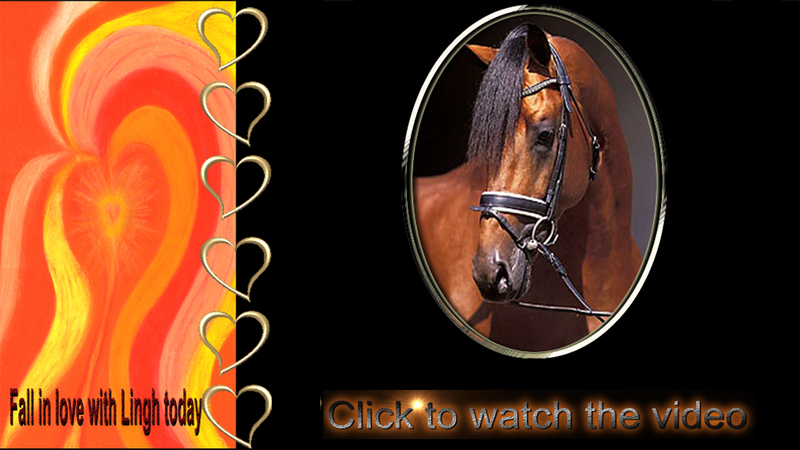 To learn more about Miller’s equine charity of choice, log on to www.montereyhorsepark.org. Wellington, FL—Offield Farms and Lingh.nl are pleased to announce the third Shoot to Win Photo Contest at the Rolex FEI World Cup Dressage Finals April 15-19, 2009. Everyone is invited to submit his or her photo that best captures the magic of the event, whether it’s a performance shot or behind-the-scenes. The winner will receive $500. In addition, a matching donation of $500 will be made to the equestrian charity of the winner’s choice. “We are very excited to offer this contest once again,” said Karin Reid Offield. “A panel of judges will be looking for the image that captures the essence of this historic event and best exemplifies the excitement of dressage.” The photographs will be displayed on www.offieldfarms.com, and the winning photo will be featured in a national publication or website. Past contest winners include Mary Cornelius with her joyful photo of horse and rider Daniel Pinto, winner of the 2007 Rolex FEI World Cup Dressage Grand Prix Freestyle B-Final, reacting to their win along with the thunderous crowd. Terri Miller won the first Shoot to Win contest with her photo of Anky van Grunsven riding Salinero during an impromptu return to the ring after their victory lap. There is no entry fee for the photo contest and both amateurs and professionals are invited to participate. All photos from the 2009 Rolex FEI World Cup Finals will be considered. Simply submit your photo (one or two photos maximum) in JPG format along with your contact information to dressage@offieldfarms.com. Offield Farms’ mission is to serve as a significant catalyst for the advancement and promotion of the sport of dressage through special events, educational programs, corporate entertainment, media projects and through personal interaction between horse lovers and horses. THE WORLD CUP IS OVER ! THE ENTRIES FOR THE PHOTO CONTEST WILL CLOSE ON JUNE 1ST. THIS WILL GIVE YOU ALL PLENTY OF TIME TO REVIEW YOUR PHOTOS AND GET THEM TO ME AS QUICKLY AS POSSIBLE. SEND ME YOUR 2 FAVORITES, AND I WILL POST BOTH OF THEM. THE JUDGING WILL TAKE PLACE AT THE CLOSE OF THE FIRST WEEK OF JUNE AND THE WINNER WILL THEN BE ANNOUNCED. MAKE SURE THE PHOTOGRAPHS ARE YOUR HIGHEST QUALITY. SEND THEM TO dressage@offieldfarms.com Good Luck !! !